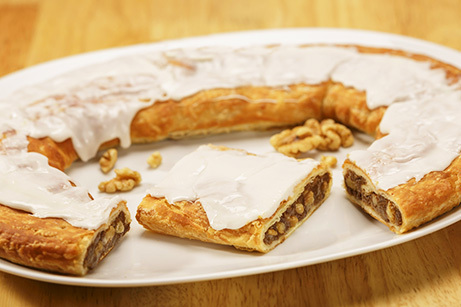 If you love anything that has nuts in it—chances are you'll love our Walnut Kringle. 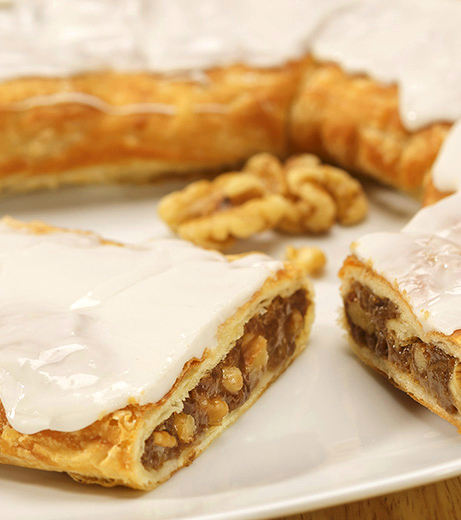 A sweet vanilla icing goes perfectly with the chopped golden walnut filling that captures the taste of walnuts that many find irresistible. Wheat flour, margarine (interesterified soybean oil, water, salt, mono- and diglycerides, colored with annatto/turmeric. Calcium disodium edta preservative. Artificial butter flavor. Vitamin a palmitate added. 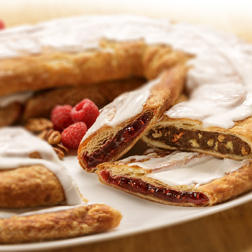 ), brown sugar (sugar, molasses, cane syrup), sugar, walnuts, 2% or less of the following: water, corn syrup, eggs, yeast, soy lecithin, soy protein, salt, dextrose, calcium carbonate, maltodextrin, cinnamon, citric acid, soy flour, canola oil, agar-agar, tocopherols preservative, calcium propionate, natural & artificial flavors, malted barley, corn starch,color added.